Dig and frame out the footers for the perimeter of the structure to the engineer’s specifications for depth and width. 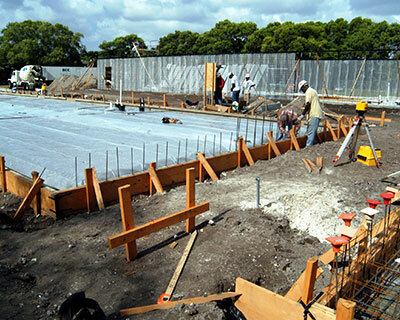 Set vertical rebar in concrete, like a fence post, just inside the footer form boards at predetermined locations. Pour concrete slab and footer. 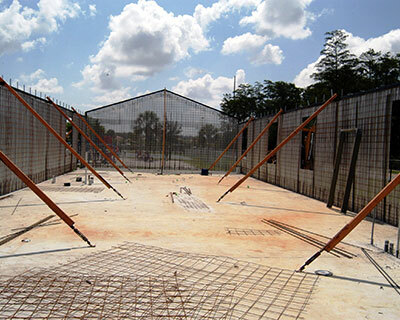 Erect the pre-designed Bond Beam System on top of the vertical rebar poles. Our System has special corner and straight line connectors for the beams and can all be assembled quickly and easily without tools. Insert the Bond Hurricane Straps in the beam slits which are pre-cut at the exact locations required by the roof system. The straps have a “U” shaped hook on the lower end from which the steel curtain will subsequently be hung. 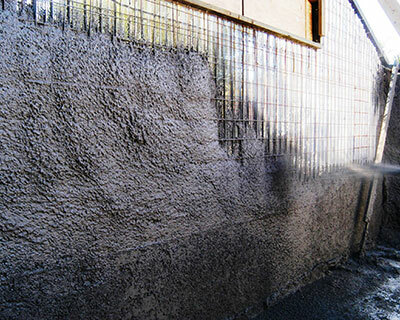 Hang the road mesh and the proprietary BOND mesh for shotcrete application. Shoot the steel cage from both the inside and outside of the structure with shotcrete machines. 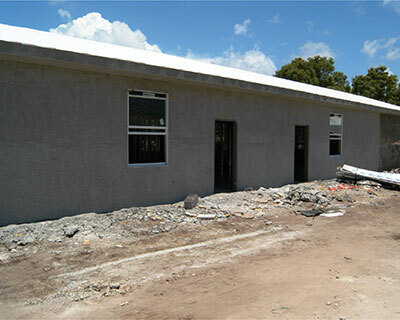 Then screed and finish the concrete walls to desired thickness and finish (Bond walls are generally 3 or 4 inches thick). Because of the shotcrete process, the density of the concrete is generally in the range of 6000 to 6500 PSI rather than the 2500 to 3000 PSI generally obtained from poured concrete. 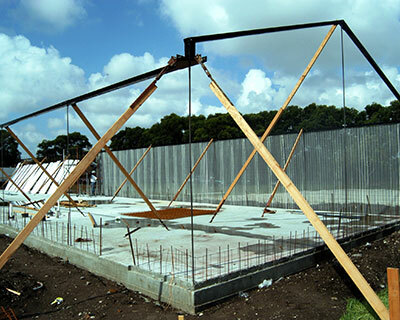 Remove the reusable Bond Steel Beam System and move it to the next structure which should already have the supporting vertical rebar steel set in concrete. Begin the process of erecting the next steel cage. The first structure is now ready to receive the roof system with the Bond Hurricane Straps tied into the rebar and sticking out of the top of the concrete walls in the exact locations where they are needed according to the roof system design.